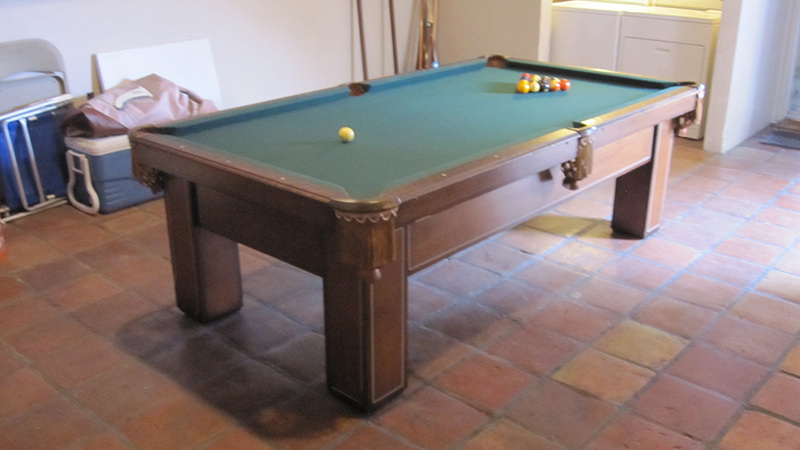 There aren’t many pool tables out there constructed to be moved on their sides, but they do exist. 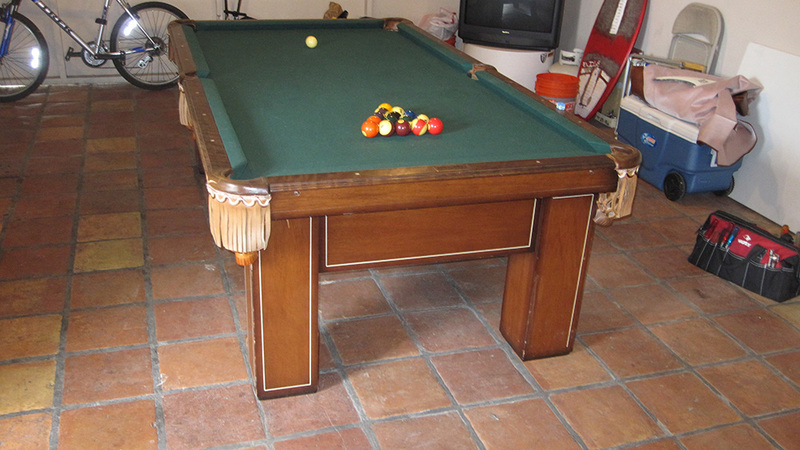 This 1970’s Golden West pool table is a testament to quality built American pool tables. 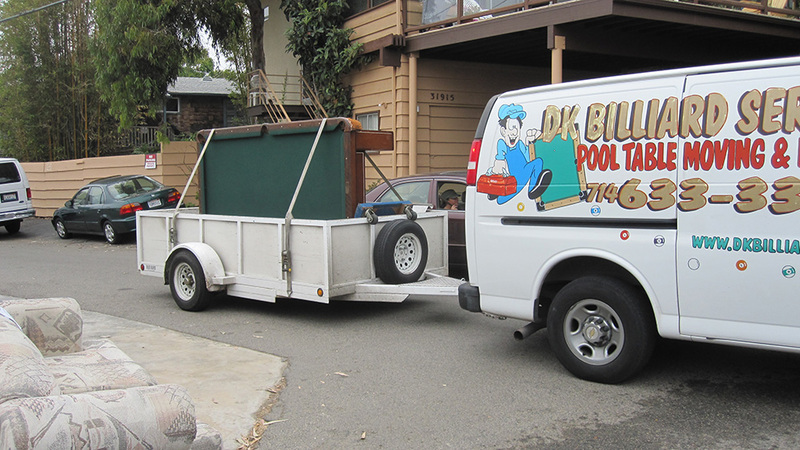 This is an eight foot one piece slate pool table that we were hired to move yesterday out of a home in Dana Point, CA to a garage in Laguna Beach, CA. Now, under normal circumstances I would never consider moving a pool table in this manner. However, in this situation if we had disassembled this pool table like we normally do, I don’t think we could have reattached the leather pockets. Our customer had only budgeted enough money for the move. These leather pockets were 35 years old and falling apart. If we tried to remove them from where they were tacked in, I think they would have fallen apart. 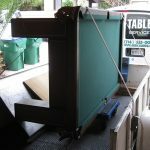 My customer mentioned to me that the last time I moved a pool table for him I used my dollies and ramp. So I decided to bring them along on this move. Luckily, all circumstances were in our favor. 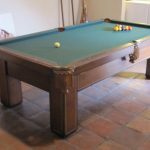 The pool table was a one piece slate, the legs of the pool table were bolted directly into the cabinet horizontally (not vertically) and the blind aprons were well supported and would not buckle under the weight of tipping the table on it’s side. Also the front door of the Dana Point home was just barely wide enough to allow the table fit through it. 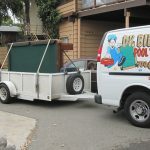 My 20 years of experience moving pool tables told me that this type of move would be possible. I would NOT recommend trying this method of pool table moving yourself. It would be best to disassemble your pool table into pieces small enough to carry by two people. It would also be wise to mark all pieces taken off of pool table so they could be put back in the same position. 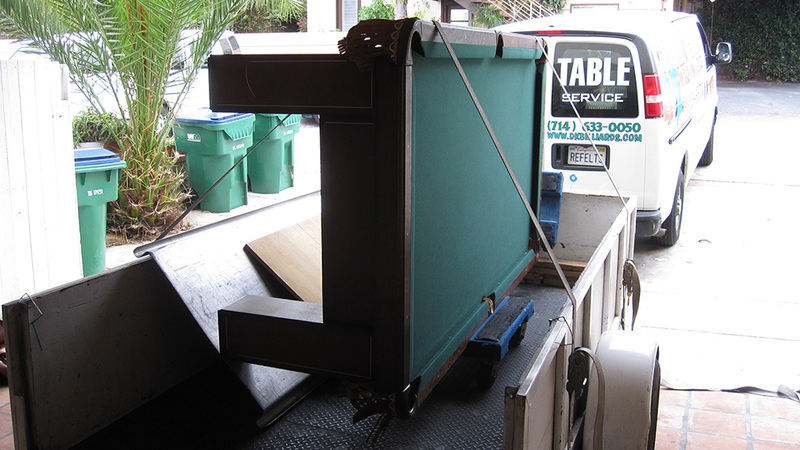 Many former customers of ours disassembled their own pool table and hired us to assemble it for them.